We sold plenty of our delicious Bean to Bar chocolate at the Lancaster Mid Winter Market on Friday 16th December and in St. Nics Arcade, Lancaster from 19th – 23rd December. FIG Tree Bean to Bar chocolate is available in 5 delicious flavours; Milk, Milk & Orange, Dark, Dark & Mint and Soya and sold as 40g bars, 100g Milk with Banana and Dark with Raspberry and a variety of speciality chocolates. Each batch is hand made from bean to bar in Garstang the world’s first Fair Trade Town using fair trade ingredients where possible and beans purchased directly from the farmer in New Koforidua, Ghana – the first Fair Trade Town in Africa. Thanks to everyone who visited us over the Christmas period and thanks go to LESS and St. Nics for enabling us to sell our Bean to Bar chocolate. And remember our Bean to Bar 40g bars are available to buy at Single Step Wholefoods, off Penny St, Lancaster all year round. We are grateful to LESS and St. Nics for enabling us to sell our Bean to Bar chocolate over the Christmas period. …Single Step Wholefoods, off Penny St, Lancaster, The Borough, Dalton Square, Lancaster and the LUSU shop at Lancaster University. Available to buy in 4 delicious flavours; Milk, Milk & Orange, Dark and Dark & Mint. Stocks are limited so get down there now to ensure you don’t miss out. 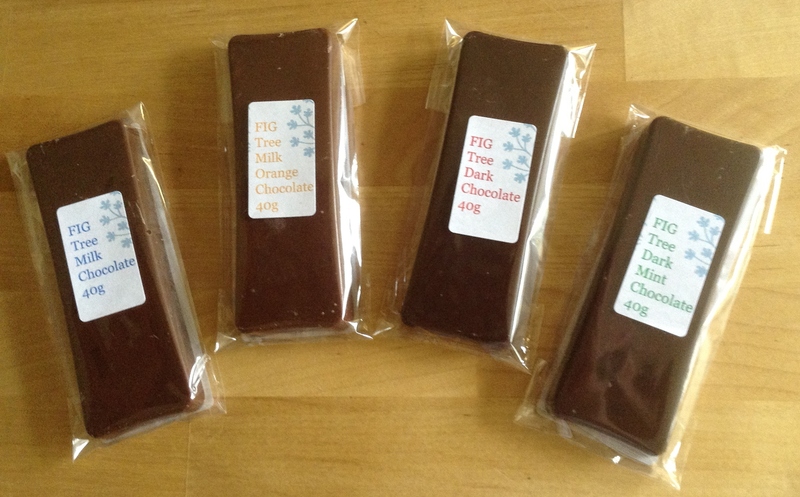 FIG Tree bean to bar chocolate is sold in 40g bars retailing at £2.50 each. Each batch is hand made from bean to bar in Garstang the world’s first Fair Trade Town using fair trade ingredients where possible and beans purchased directly from the farmer in New Koforidua, Ghana – the first Fair Trade Town in Africa.